A pair of Columbia University astronomers using NASA’s Hubble Space Telescope and Kepler Space Telescope have assembled compelling evidence for the existence of a Neptune-size moon orbiting a gas-giant planet 8,000 light-years away. If their findings are correct, it will be the first moon found orbiting a planet beyond our solar system. The planet, Kepler 1625b, is between 5.9 and 11.67 times the size of Jupiter. It orbits a G-class main sequence star with around 8% more mass than our own in the constellation of Cygnus, every 287.4 days. The planet has been known about for some time, but whilst re-examining the data gathered by the Kepler space observatory that led to its discovery, Alex Teachey and David Kipping from the University of Columbia noticed anomalies in the way the planet dimmed the star’s light as it transited between the star and Kepler – anomalies that in ordinary circumstances should not have been there, but which were enough to get the astronomers 40 hours observing time using the Hubble Space Telescope. Able to study the star with four times greater precision than Kepler, HST was used to observe Kepler 1625 both before and during one of the planet’s 19.5 hour transits across the star. In doing so, it recorded not only the anticipated dip in the star’s brightness, but also a second dimming along the same orbital path, starting some 3.5 hours after the first had started. 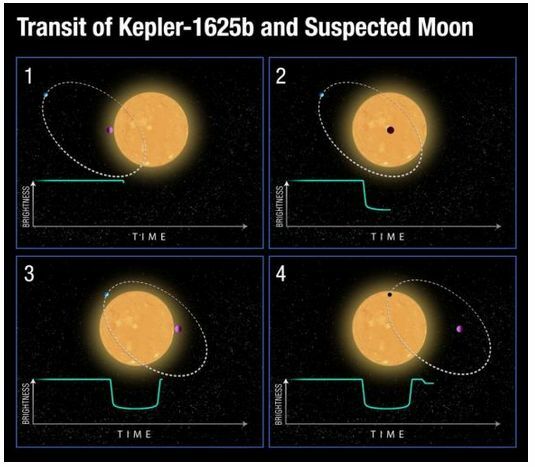 The Hubble data also revealed that Kepler 1625b started its transit across the star 1.25 hours earlier than it should have. When put together, the most likely explanation for both the “premature” transit and the extra dimming of light from Kepler 1625 is that a vary large, somewhat distance moon is orbiting the Jupiter-like Kepler 1625b. The presence of such a body in orbit would set a common barycentre (centre of gravity) between the planet and the moon that would cause the planet to “wobble” from its predicted location in its orbit, leading to variations in the start times for transits. Similarly, the presence of a large moon orbiting it would cause the additional dimming in the star’s brightness during a transit. 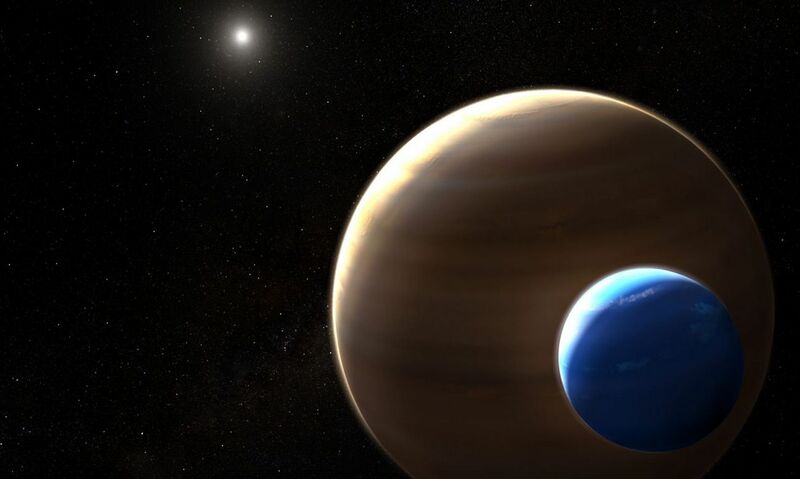 Before the exomoon’s existence can be confirmed, further observations by Hubble are required. However, the preliminary data gathered suggests it could be around 1.5 percent the mass of its parent star – which is a very close mass-ratio between the Earth and its moon. However, given both the massive planet and its moon appear to both be gaseous in nature, should the moon’s existence be confirmed, it raises intriguing questions as to how it was formed. In the case of solid satellites like the Moon, their creation is likely due to a collision between Earth and another planetary body that left debris that coalesced into the Moon. Such a path of formation for a gaseous body, however, is exceptionally unlikely: anything impacting with Kepler 1625b, for example, would likely be absorbed into it, rather than throwing off matter to form a separate orbiting body. One of the most intriguing theories for the moon’s possible existence is that it may have started life as a separate planet orbiting Kepler 1625, but over time it came under the gravitational influence of the massive Kepler 1625b, and over time was drawn into orbit around it. If this should prove to be the case, it could have interesting implications for future exoplanets and the moons that may be found orbiting them. NASA has confirmed that the first uncrewed test flights of the SpaceX Crew Dragon and Boeing CST 100 Starliner commercial crew transports intended to fly astronauts to the International Space Station (ISS) have been delayed. Under the original schedule, the uncrewed flight test for Crew Dragon had been scheduled for November 2018 and would have been followed by a 2-week crewed flight with NASA astronauts Bob Behnken and Doug Hurley in April 2019. Under the new schedule, these flights will now occur in January and June 2019 respectively. Similarly, the first uncrewed flight for the CST-100 Starliner is now planned for March 2019 with the crewed test previously scheduled for mid-2019 now set for August 2019. If SpaceX and Boeing maintain the new schedule, NASA believe the first operational commercial crew mission could take place in August 2019 – which would suggest a Crew Dragon would be the vehicle used, given the CST-100 would just have completed its crewed test flight, requiring some post-mission analysis. The second operational will then follow in December 2019. Both of these dates straddle the end to the US government’s extended contract to use seats on Russia’s Soyuz vehicle to send US astronauts to and from the ISS. While unrelated, the news of the delays came as US / Russia tensions concerning the hole found in a Soyuz capsule became strained once more. As I’ve previously noted (see here and here), at the end of August a slow leak was detected in a Soyuz MS-08 docked at the ISS. 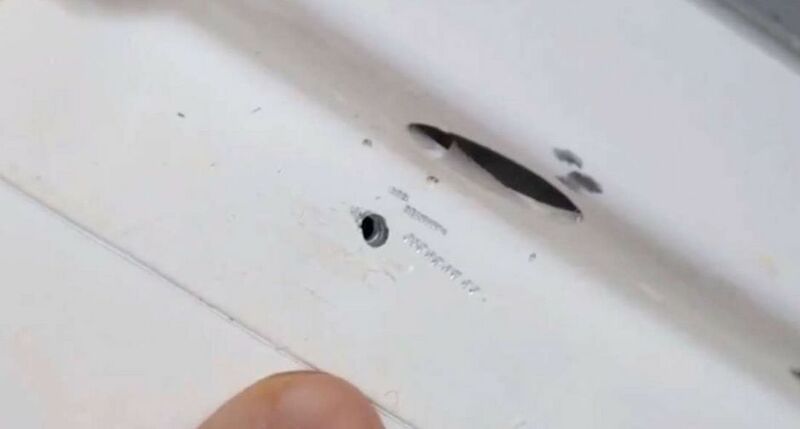 Initially, it was thought the hole causing the leak was the result of debris puncturing the Soyuz hull. However, it emerged the hole appears to have been drilled. Core thinking around it was that a mistake had been made during the vehicle’s fabrication or in preparing it for flight at the Baikonur cosmodrome, and then hastily covered up. In either case, it is believed a substance unfit for purpose was used in the repair, which gradually degraded in space prior to failing completely, causing the pressure loss. However, fuel was poured on the embers of speculation in September when Russian media reported the hole may have been cut in space, possibly by one or more US astronauts – and the initial source for these claims was the director of the Russian space agency Roscosmos, Dmitry Rogozin. The claims resulted in some anger, mission commander Andrew “Drew” Feustel issuing a strongly worded statement from the space station, with NASA and Roscosmos attempting to push back on the rumours. At the start of October, Feustel returned to Earth with fellow astronaut Ricky Arnold and cosmonaut Oleg Artemyev, Rogozin aboard the second of the two Soyuz vehicles docked at the ISS, and just days afterwards, Rogozin repeated his extraordinary claims, stating that a preliminary report on the leak showed that the hole was not the result of a manufacturing defect, implying it was deliberate and may have been done in space. At the same time, he threw shade on the US Government, claiming unnamed American officials have been “interfering” in the Russian space agency’s cooperation with NASA. Nor was that all. In his statement, Rogozin accused SpaceX of attempting to squeeze Russia out of the space launch services market, and also pointed a finger at the US Air Force’s secretive X-37 mini-shuttle programme, re-stirring the theories that it is some form of weapons platform. Americans have this thing, the X-37. We don’t understand its purposes. Rather, we do understand, but we have not received an official explanation. Essentially, this thing can be used as a weapons carrier. How this all pans out remains to be seen. NASA Administrator James Bridenstine in due to meet Rogozin at Baikonaur later this month, while ISS astronauts are planning a spacewalk in November to gather more information on the hole, as the Soyuz remains docked at the ISS. 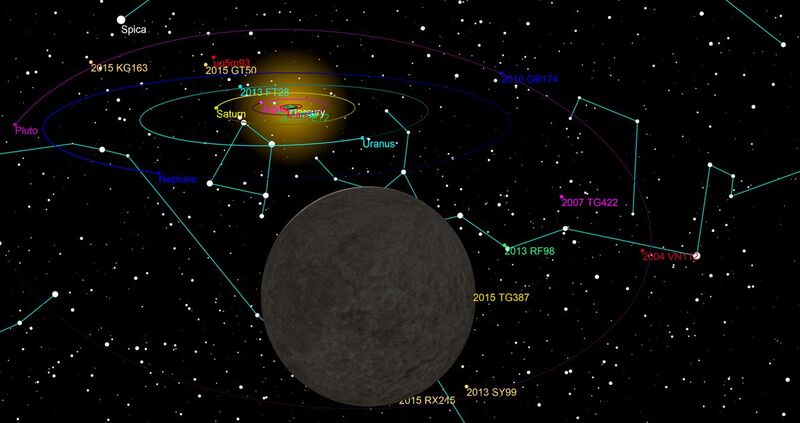 Astronomers led by Scott Sheppard from Carnegie University and using the Subaru Telescope on Mauna Kea, Hawaii, have discovered the latest dwarf planet orbiting the Sun. 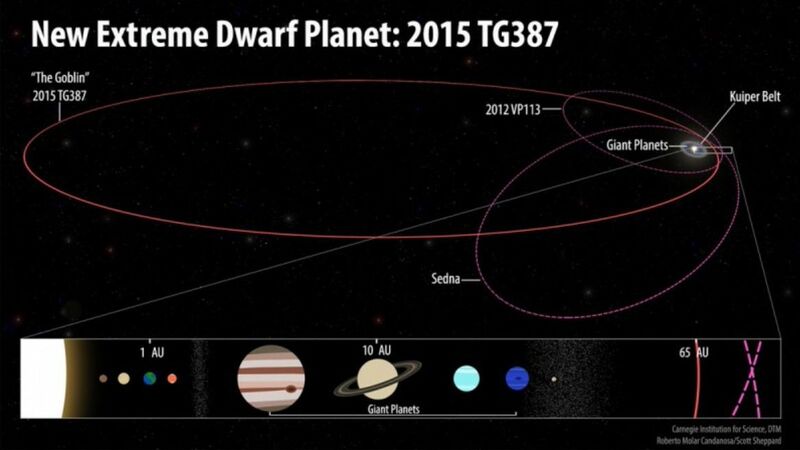 Catalogued as 2015 TG387, it has been informally nicknamed The Goblin, and it sits within one of the most extreme orbits around the Sun so far discovered, never coming closer to the Sun than 65 AU (65 times the distance from the Earth to the Sun) and extending as far out as 2,300 AU. Confirmation of its existence has been three years in the coming; as its official name indicates, the tiny world was first located in 2015. However, such is the enormous distance between it and Earth and the speed with which it moves along its orbit – it takes around 40,000 years to go around the Sun -, Sheppard and his team required several years to confirm its existence. The informal name came from The Goblin being discovered at Halloween, and it is one of a group of objects that are also called Inner Oort Cloud Objects (IOCOs), a group that includes 2012 VP113, and Sedna, both of which also have eccentric orbits around the Sun, and are part of a growing group of such bodies astronomers are trying to use to locate the mysterious Planet X (or Planet 9), a large planet approximating to Neptune, thought to be occupying an orbit heavily inclined to the plane of the ecliptic and which carries it around the Sun at an extreme distance. In particular, this group of objects, which have widely dispersed eccentric orbits, all have more-or-less common points of perihelion (point of closest approach to the Sun, which strongly suggest they have been pulled out of the plane of the ecliptic and into their odd elliptical orbits by the gravitational influence of a large body somewhere far out in the outer solar system – although whether or not that body is indeed a planet is itself the subject of debate. The hope is that by locating more objects like The Goblin and mapping their orbits, astronomers will be able to build a model of the likely orbit for whatever is influencing them, greatly narrowing where they need to look in order to find the object itself. The Goblin is estimated to be about 300 km (190 mi) in diameter – roughly half the radius of Pluto’s Charon, and one-third that of the radius of Sedna, making it a relatively small object, and at perihelion it is almost twice the distance of Pluto from the Sun. Other than this, not a lot more is currently known about it. 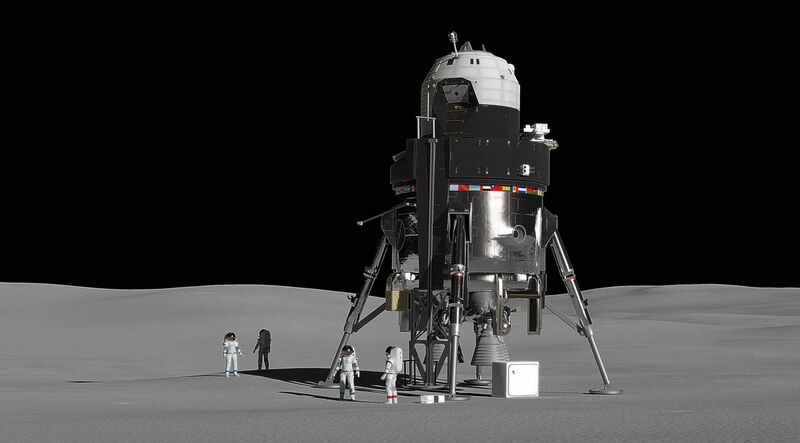 Lockheed Martin has revealed a concept spacecraft able to land on the lunar surface as a part of US plans to return a human presence to the Moon some time in the 2020s. The vehicle is intended to operate between the proposed Lunar Orbital Platform-Gateway (LOP-G) and the surface of the Moon, and was unveiled at the 69th annual International Astronautical Congress (IAC) in Bremen, Germany, on October 4th, 2018. Looking a little like the oversized offspring of a liaison between the Apollo Lunar Excursion Module (LEM) and R2D2, the vehicle is designed to deliver a crew of four to the surface of the Moon, together with up to one tonne of equipment and supplies, and remain there for up to two weeks at a time as a base of operations for surface studies and exploration. Part of the cargo would be a small, unpressurised rover vehicle, possibly similar in nature to the rover used during Apollo missions 15 through 17. 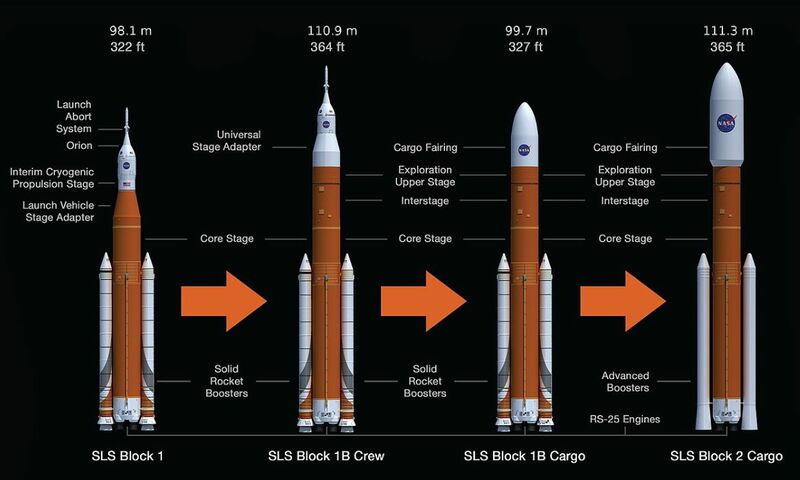 Meanwhile, Boeing has confirmed plans to change part of the upcoming Space Launch System (SLS). Originally, the SLS was due to fly in June 2020 in what’s called the block 1 configuration, featuring the Interim Cryogenic Propulsion Stage (ICPS), which was to have been used just the once before being swapped to the more powerful Exploration Upper Stage (EUS) in what is called the SLS block 1b configuration. These plans have now changed due to NASA requesting the performance of the EUS is enhanced so the block 1b variant of SLS will be capable of lifting “co-manifested” payloads into orbit. That is, launching two large payloads such as two elements of the LOP-G on a single vehicle, rather than having to use separate rockets. Exploration Mission 1 (EM-1), an uncrewed flight of the Orion MPCV and service module on an extended 25-day mission around the Moon and back, scheduled for June 2020. Exploration Mission 2 (EM-2), a crewed flight of the Orion MPCV and service module on a 9-day mission around the Moon and back with four crew, scheduled for June 2022. Exploration Mission 3 (EM-3), a crewed flight of the Orion MPCV and service module on an extended (16-26 day) mission to a lunar halo orbit (the type of orbit the LOP-G will occupy) and back with four crew, scheduled for late 2022. Europa Clipper, the launch of NASA’s flyby mission to Jupiter and its icy moon, Europa, currently scheduled for 2023. However, in order for at least two of these launches to go ahead (EM-2 and EM-3), the ICPS will have to go through additional flight certification so that it can be used with crew launches – something that was not originally a requirement in its ICPS design specifications. In the meantime, the changes to the flight schedule mean that the first SLS block 1b mission using the uprated EUS will now take place in 2024, delivering the first two elements of the LOP-G to a L2 Southern Near Rectilinear Halo Orbit (NRHO), together with 4 crew in 30-day mission. ” Americans have this thing, the X-37. We don’t understand its purposes. Rather, we do understand, but we have not received an official explanation. Essentially, this thing can be used as a weapons carrier. While I personally believe that the X-37 wasn’t initially made as a civilian transporter but is indeed a secretive US Air Force programme, it isn’t very wise accusing Americans for stuff that is probably true … but can’t be proven. Yes, of course everybody knows they are always scheming and planning and spying and lying and always, like really allfuknways, supporting the wrong side in any conflict but … you know, they are a wounded animal right now, so better not to aggravate them. The Roscosmos guy ain’t a diplomat or politician but a scientist and a admin. And as such he shouldn’t stir up international trubbel. Actually Rogozin IS a politician – as I noted in September. He was directly involved in the invasion and annexing of Crimea, and is one of a number of Russian politicians close to Putin under EU / US / Canadian sanctions as a result. Hence why NASA Administrator Brindenstine is only meeting with in this month to discuss the situation as a part of an already-planned trip to Baikonaur in Kazakhstan, rather than the two getting their heads together sooner on “neutral ground”, so to speak, somewhere in the EU. Even his appointment to Roscosmos in May 2018 seems to have been something of a provocative, politically motivated move by Putin. The narrative of the X-37B being a weapons carrier feeds into a lot of conspiracy theories that grew out of it being a joint unclassified NASA – US DoD programme that was transferred to the US Defence Advanced Research Projects Agency (DARPA) and became classified – and as it is classified, it must be all about weapons systems. The Pentagon has always denied this – as they would – but thus far over 5 missions, X-37B appears to be doing exactly what the pentagon claimed: researching technologies and systems that might be used to advance space flight capabilities for both military and commercial / non-military purposes. Some of this work includes evaluating flight dynamics of such vehicles (Boeing, as the developer, had planned a much larger variant of the X-37, capable of carrying a crew of 6), re-entry materials designed to protect a craft whilst entering the Earth’s atmosphere, materials that could help keep electronics, etc., on a space vehicle cool while it is fully exposed to the Sun without the need for complex additional cooling systems, etc. Obviously, such capabilities could be used in weapons – or in a future generation of weapons delivery vehicles / platforms (particularly given Trump’s call for a military “Space Force”). However, Rogozin’s comments appear more towards fomenting discord than anything else – although what his motive for doing so is hard to fathom. Thank you, Inara, for the clarifcation. My academic interest in Eastern-European history ended with the perestroika and when the wall came down. So, yes. Rogozin is a politician indeed. BUT, and this is a formal but: There was neither an invasion nor an annexation of Crimea by Russian troops. Thats a twist by the western allies. 1) Russian troops have always been on Crimea, it’s their biggest Black Sea navy harbor. Even after that always drunk Yeltsin gave the Ukraine away for some bottles of vodka, the stupid Ukrainian leaders were more than happy to gave the Crimean navy bases to the Russians on lease. So in fact they never left, ergo no reason for an illegal invasion. there was no breach of international law by Russia. All they did was protecting the civil population during their attempt to vote for independence from the failed nazi state Ukraine. We should be thankful for their presence, as they avoided violent disturbation of the proceedings. 2) Not a single shot was fired throughout that “invasion”. Russian troops acted as body guards and referees and held up law and order throughout the plebiscite. Without their presence we would have seen a blood bath, I can guarantee you that. 3) Annexation didn’t happen. Else we’d heard about it in the news and from The Hague. But in order to hear from them there must first be an accuser. Nobody accused Russia of annexation. 4) What happened was a recession: Crimean people (80% Russians) wanted to get away from the broke and sad and openly nazi gov’ment of Ukraine, declared themselves independent, and then asked to be accepted as part of the Russian Federation. That was gladly accepted by the Kremlin. DARPA isn’t an innocent science lab. The fact alone that they’ve garbled up the X-37 programme speaks volumes. It’s far from being a conspiracy theory that everything they touch is destined to become weaponized. From their cute robots to space thingies. And even more now that they classified the programme. But as I’ve already mentioned in my first comment Rogozin was rather dumb to say out loud what 90% of the planet thinks anyway. Never said it was. However, like Boeing’s Skunk Works, DARPA’s remit extends well beyond pure weapons systems research – civil aviation has benefited from DARPA work for example. The move also wasn’t garbled: DARPA is in fact the correct agency for the project to “move to” once NASA ceased to prioritise spaceplane development (and DARPA were involved in the X-37 from the start, alongside NASA). According to information received, the situation in the Crimea and Sevastopol is equivalent to the international armed conflict between Ukraine and the Russian Federation. This international armed conflict started not later than February 26, when the Russian Federation employed members of its armed forces to gain control over parts of the territory of Ukraine without the consent of the government of Ukraine. The report goes on to state that the law on international armed conflict has applied to the situation in the Crimea since March 18, 2014, and that according to that law, Russia’s presence in the Crimea and Sevastopol can be considered an occupation. As to whether or not shooting took place, that is arguable. All we do know is around 6 deaths occurred during the initial Feb-March 2014 occupation period, and subsequent to that date, the death toll has risen, including 298 souls aboard flight MH-17, which Dutch and Australian investigations occurred as a result of the conflict, and by a Russian weapons system moved into Crimea as a part of the occupation, and possibly even operated by Russian forces. It’s not unfair to state that had Russia not opted to seize Crimea, that aircraft would not have been brought down. Following the fall of the Soviet Union in 1991, Ukraine was recognised as an independent nation, and Crimea an autonomous legislative state within that nation. This was confirmed by the Budapest Memorandum on Security Assurances (Dec 1994), of which Russia was a signatory, which underlined Ukraine’s territorial integrity. From 2010 through February 2014 (the time of the invasion), Ukraine was under the leadership of pro-Russian Viktor Fedorovych Yanukovych. When he came to power, Ukraine was already in negotiations with the EU to establish an Association Agreement, which was popular with the Ukrainian people right across the country, and seen as a means of both increasing Ukraine’s status and economic independence. After taking office, Yanukovych sought closer ties with Russia over the EU deal. He eventually rejected the EU agreement in November 2013, favouring a Russian financial bail-out. This prompted protests right across the Ukraine from December 2013 through February 2014. On February 21st, 2014, Yanukoych fled Kiev to Moscow a day ahead of a Ukrainian parliamentary vote that would have removed him from office. It was this event – not concern for the well-being of the people in Crimea – that sparked the Russian decision to annexe Crimea, which commenced one month later. As noted above, the move by Russia was seen as illegal by the international community (north, south, east and west with only 26 UN nations voting in favour of Russia’s actions over all three UN resolutions on the matter), the EU and The Hague, all of which have referred to the move as both an annexation and an occupation. Heyas Inara, I’ve spent now copious amounts of time to get my argument together and wrote it offline, not in the spur of a heated blog comment section. And I noticed first of all, what a weak squishy thing international law of nations is, that it can be interpreted and bend to anyones will and interests. But can we please, at least agree on the simple truth that The West (USA/EU/UK/NATO) are the agressors here, on the way to surround Russia with a steadily growing arsenal of military installations, growing ever closer to Russian borders? The latest statements of various Western politicians and NATO generals confirms that notion. What did that English general just say: “We gonna bomb Syria now. And if you dare to defend yourselves, it will be intrepreted as an act of war.” Can’t be anymore bully-ish and blatantly unfair than that. But into media res now: All your points are valid, but you leave out a lot that would support my secession-arguments. First of all, Ukraine is a deeply divided country and it’s not only the Russian-speaking east against the ‘west-leaning’ west, there are secession-movements amongst Hungarian and Romanian minorities in the West as well as territorial disputes with Poland. Even before the SU fell apart in January 1991, the Crimeans after a referendum became a Autonomous Republic of the USSR, then in May 1992 the Crimean parliament declared independence from Ukraine. A referendum to confirm this never took place due to Kiev’s opposition, but Kiev was forced to expand on Crimeas autonomous status. I guess that makes it pretty clear, Crimea was never an integral part of Ukraine. Of course Moscow did not support Crimea’s secession just for the sake of the people but – in the end – for the navy-base in Sevastopol. Still, the will of the people was clear and the referendum everything but an exercise in propaganda, as you put it. Already in early February 2014 the Crimean parliament had asked Moscow for protection, preparing for an uncertain future and immediately after the regime change end of Febuary they announced to hold an independence-referendum, scheduled for May25th! Second, the whole Association Agreement saga, we all know how the EU loves to screw aspirant new members or associates. Yanukovich saw this, tried to get a better deal by talking to the Russians and in the end, when the EU wouldnt budge, accepted Russia’s offer – simple as that. Tell me, where is the advantage of loosing the whole Russian export-market for the right to NOT export much to the EU due to a strict quota-regimen? The Maidan demonstrations that followed – it was never everybody against Yanukovich, there were equally massive demos in support of the president, western media just ignored them. The way Yanukovich was removed from office, there was nothing legitimate about. Heck, Yatsenyuks interim regime didn’t even get the constitutionally necessary 3-4 majority to be confirmed. The ‘Polite People’ in Crimea, the eventual secession, the civil war in Donbass – that all happened because people in the Russian-speaking parts regarded the regime change as an illegal armed coup and did not recognize the new government. Then the first law the new Rada passed was the law to abolish Russian as official language – way to go to stir up already mistrustful people. So the people in the east took to the streets again and the rest is history – and we are left arguing who first disregarded the famous Budapest Memorandum, the West, supporting an illegal coup or Russia, supporting an independence movement. One more point, please don’t drag the MH17 tragedy into this just to enlarge the Crimean death toll. We still dont know what happened there, we will probably never be told and no – YT clips of BUK-movements and Bellincat announcements are no proof! Latest news is, after the Dutch showed fragments of the alleged missile, produced in Soviet-Russia, the Russians traced that missile back to a West-Ukrainean air defense unit, delivered there in 1986. So, way too much fog for a final judgement here, I would say. But I guess we could discuss this complex topic further until the cows come home, with so many more points to mention, more questions to answer, more disagreements – so lets maybe agree to not agree? I’m happy to agree to disagree. I’ll remain with the side of international law, which runs counter to the central tenet of your original argument (“no invasion took place because it never went to The Hague” – to paraphrase). Whatever the internal machinations of Ukraine (which I agree are complex), Russia’s actions in 2013 amount to an annexation under the rule of international law, and The Huge has stated Russia’s presence in Crimea amounts to military occupation.